They're staples on every American dining table and the requisite ingredients in virtually every European cuisine, so inseparable that polite society dictates they always be passed together. Salt and pepper are the undisputed champions of condiments—but how did they get so popular? Table salt—aka sodium chloride or NaCl—has been a preferred seasoning since the dawn of time. Our bodies require three to eight grams of NaCl to perform a variety of metabolic functions and, as such, our desire for salt is so intrinsic that "salty" is one of the four elemental types of taste bud (along with sweet, sour, and bitter). Because we need salt to survive, it has been a highly valued commodity throughout history. Salt has helped build early civilizations, driven empires, and even been used as currency. Roman soldiers were paid in salt, or "sale" in Italian (and "sal" in Spanish), which grew into the modern English word of "salary." Interestingly, until recently, salt and sugar were often used simultaneously. From Roman times through the Renaissance, chefs routinely served salted and sugared dishes at the same time. It wasn't until the 17th century in France that salt and sugar were separated. It was royal cooks for Louis the XIV that began serving salted dishes throughout the meal to stimulate appetite and only serving sweet foods at the end to satiate the appetite—signifying an end to the meal. 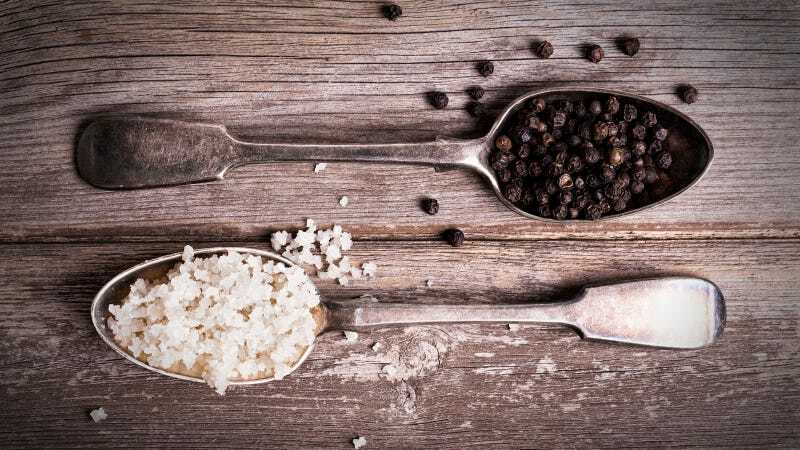 Black pepper, though not universally needed like salt, is an equally-valued commodity throughout the West—one so popular that it has arguably changed the course of history. However, it wasn't always this highly prized. You see, black pepper is native to Southeast Asia—specifically Thailand, Vietnam, Malaysia, and the Malabar Coast of India, where it has been a staple in local cooking since the second century BC. Like many strong spices, pepper has historically been used as both a condiment and a medicine to treat a variety of illnesses from constipation, hernias, and heart disease to diarrhea, joint pain, and eye infections. However, not all peppers are created equal. During the Roman era, long pepper (piper longum) was the en vogue pepper species—not our familiar black pepper (piper nigrum). And since long pepper was both hotter (thus more potent according to the day's medical establishment) and reputedly reduced phlegm while boosting virility, it was very popular among the upper classes. Long pepper was so popular that other Roman castes began clamoring for similar but less pricey spices, which traders were more than happy to provide in the form of black pepper. And since black pepper grew further West than its longer cousin, the black variety was far easier and cheaper to import back to the Empire. Over the next few hundred years, black pepper's popularity skyrocketed—so much so that when Alaric the Visigoth sacked Rome in the 5th century, he demanded 3,000 pounds of peppercorns as part of his ransom. It was even used as a form of currency in some cases, much like salt before it. After the Roman Empire fell, Persian (and later Arab powers) took control of spice export routes from India to the Mediterranean, while Italian powers monopolized the European spice trade. This led directly to the rise of many Italian city-states, and played an important role in the emergence of the Renaissance, thanks to the massive income afforded by the lucrative trade—which also included cinnamon, cloves, nutmeg, and ginger. Remember, during the Middle Ages, spices were an ultra-luxury item afforded only by the rich, who were willing to spend big bucks to liven up their meals. What's more, this spice monopoly (both the local Italian-dominated market and the Islamic-controlled overland trade routes) is what enticed Portugal to find a sea route to China, leading to the discovery of the Americas. With countries willing to expend that sort of effort and money on a spice, it's little wonder that pepper was often referred to as Black Gold. Black pepper's popularity dropped off a bit in the early 17th century, following the discovery of chili peppers in the New World and the expansion of the European diet beyond gruel. But it came roaring back during the Enlightenment. It was, once again, the royal chefs of Louis XIV's court that elevated black pepper to its current status. Louis the XIV was a notoriously picky eater and preferred his food as lightly seasoned as possible—he considered seasoning a vulgar act. In fact, he banned outright the use of all eastern spices beyond salt, pepper, and parsley (deemed more wholesome and exquisite than ruddy cardamom). Black pepper's spiky, pungent flavor provided just enough kick to the King's meals without overwhelming the taste of the underlying foods to satiate his needs.